Lowdown: The tale of a small community, defined by its religiosity, as its paradigms are challenged by the even more religious. 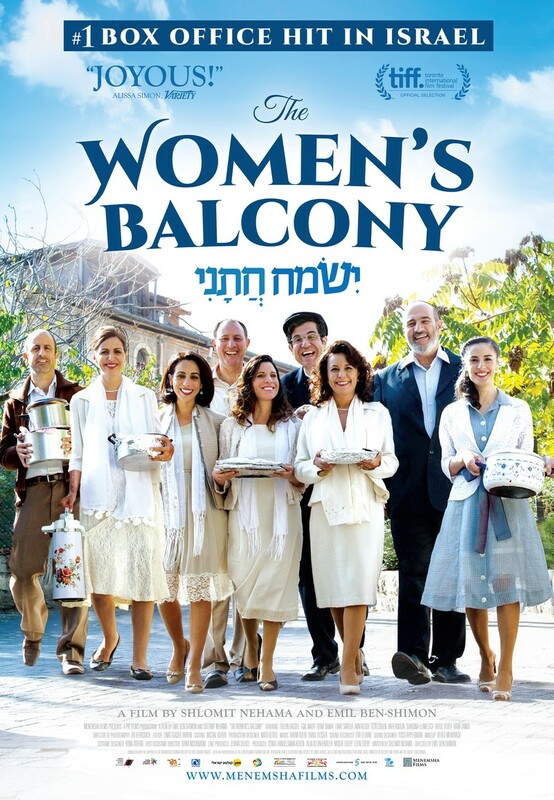 The Women's Balcony (originally ישמח חתני, literally "joy to my husband") is a recent Israeli movie about a smallish, close, community of religious Jews living in modern day Jerusalem. They are not rich, but it's their community that gets them along. Disaster strikes when, during a Bar Mitzvah ceremony, the women's balcony (the area of the synagogue dedicated to women, who are otherwise not allowed to mix with men in orthodox run synagogues) collapses. Among the victims are rabbi's wife, the Torah scroll, and the synagogue itself that is barred shut. Problem is, the community is nothing without its synagogue! As luck would have it, a fellow rabbi passing by helps our synagogue-less refugees and takes them under his wing. However, all is not what it first seems; that new rabbi is quite pedantic and won't allow for the same practical compromises our community members took for granted, causing a rift in the community and pitting husbands against wives. There are numerous problems with The Women's Balcony. For a start, it is not as entertaining as it was meant to be. That is to say, as comedies go, it is not so funny a comedy. However, the film is quite illuminating through its perspectives on the lives of religious Jews in Israel. To the best of my personal knowledge and familiarity, the movie is a pretty accurate portrayal of the culture of religious Jews in Israel. This includes practices that seem ludicrous to me, such as deploying non Jews to switch the light on during a Sabbath, which to the eyes of the people in the movie seems a perfectly rational act. Or, more relevant to the #MeToo age, the way basic discrimination between the sexes is taken for granted by both sides. The film reeks of these defunct values. I will put it this way, most of pluses earned by watching The Women's Balcony come from that anthropological factor. I recall numerous other movies depicting this reality or culture, to one level of authenticity or another. This one seems, to these eyes, to be the first such movie I see that isn’t meant primarily for the secular viewer. The Women's Balcony is clearly designed for audiences not too dissimilar to those portrayed in the movie, that is to say - traditional to religious Jewish Israelis (but not fully orthodox Jews, who will not watch film anyway). Which, in my opinion, points at the processes going through Israeli society over the years: increased religiosity, that is heavily bundled with increased nationalism and a general drift of Israeli mainstream politics to the right. Overall: 3 out of 5 crabs, not for the movie and its qualities as a piece of art but rather for the unique glimpse it provides into this world that exists somewhere in the real world.